The Toronto Star: ARCA graduate Mark Collins quoted in article on "Crimes of the art"
Last month, thieves stole work from a collective of Toronto artists. OPP officer Mark Collins is doing what he can to get it back and build some respect for a criminal realm worth $6 billion a year. Journalists Cailynn Klingbeil and Jana G. Pruden from the Edmonton Journal have published an article where they have interviewed the 33 year old Edmonton man charged by the RCMP on January 29, 2014 with Possession Stolen Property over $5,000; Possess a Controlled Substance for the Purpose of Trafficking; and Possession of Proceeds of Crime in connection with the thefts from the Montreal Museum of Fine Art. In a strange twist of you are famous three times and not just once, Simon Metke was first interviewed by CBC News Edmonton in December 2011 at his South Edmonton, Water's Edge condo on Saskatchewan Drive regarding incomplete works by the developer on the exterior of the highrise development. 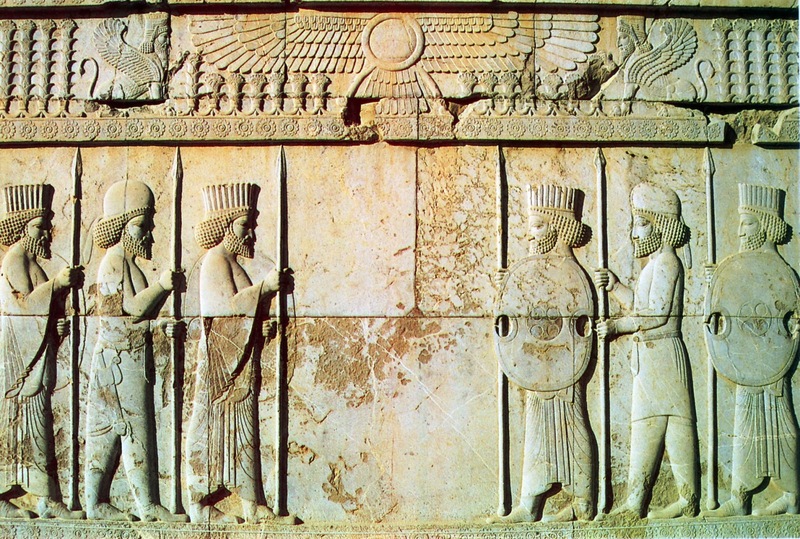 During his interview with Klingbeil and Pruden, Metke indicated he was drawn to the Achaemenid bas-relief panel stolen from the Montreal Museum of Fine Arts in 2011 because of his own interest in Mesopotamian religion and art. He also indicated that he was pleased with having protected the object so that it didn’t get destroyed or lost. Mr. Metke's feeling of protection towards cultural patrimony also seems to have included historic houses. 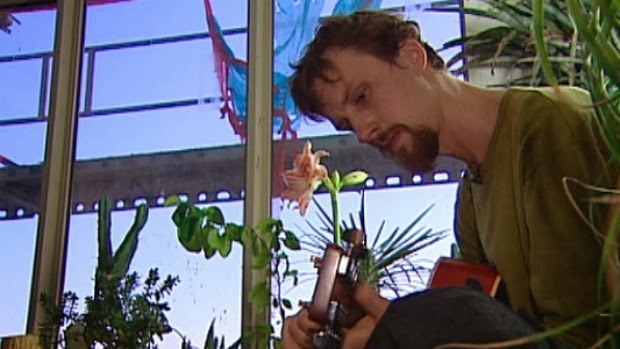 In March 2013 he was listed as a campaign team member for an Indiegogo crowd sourcing effort to raise $80,000 to preserve a historical landmark home to be designated as "The Healing Arts History House". The home was to be utilized as a community centre for art, massage, music, dance, health, sustainable research, and community living. The project only raised $1450 CAD. CTV Edmonton News has a live interview with the puzzled Mr. Metke which Canadian viewers can see here. In further information related to this ongoing investigation, ARCA was informed by Sergente Mélanie Dumaresq, Agent d’information, Service des communications avec les médias for the Sûreté du Québec (via email) that no reward has been paid out related to this case. When asked if police acted on a tip, Sergente Dumaresq replied that “Information received from the public enabled us to advance the investigation and identify the suspect.” She added that the investigation was begun by the Service de police de la Ville de Montréal (SPVM) but was transferred to the Sûreté du Québec in order to make use of the expertise of the integrated artworks investigation team, a specialized team composed of members of the Sûreté du Québec and the Royal Canadian Mounted Police. Sergente Dumaresq stated that the investigation indicates that the suspect did not commit the theft at the MMFA, but purchased the object knowing that it had been stolen. Metke has been ordered to appear in an Edmonton courtroom on March 19, 2014. At a press conference today in Montreal, the Sûreté du Québec - Enquête de l'Équipe intégrée des enquêtes en œuvres d'art and the Royal Canadian Mounted Police, in cooperation with AXA Art Insurance Limited and the Montreal Museum of Fine Arts, announced the recovery of the Achaemenid bas-relief panel stolen from the gallery more than two years ago. On October 26, 2011, a surveillance camera at the Montreal Museum of Fine Arts recorded a suspect in a baseball cap walking out of the gallery with a satchel believed by police and the museum to possibly contain one of the stolen artifacts reported to be worth "hundreds of thousands of dollars" (Montreal Gazette). Three months later, an Art Alert (Case File : 11-98, dated February 14, 2012) issued by the Enquête de l'Équipe intégrée des enquêtes en œuvres d'art (the official name for Canada's Art Crime Enforcement Unit headquartered in Montreal) publicly identified the stolen objects as a 1st century C.E. yellow Numidian marble "Head of a Man, Egypto-archaizing style" and a more valuable 5th century B.C.E. 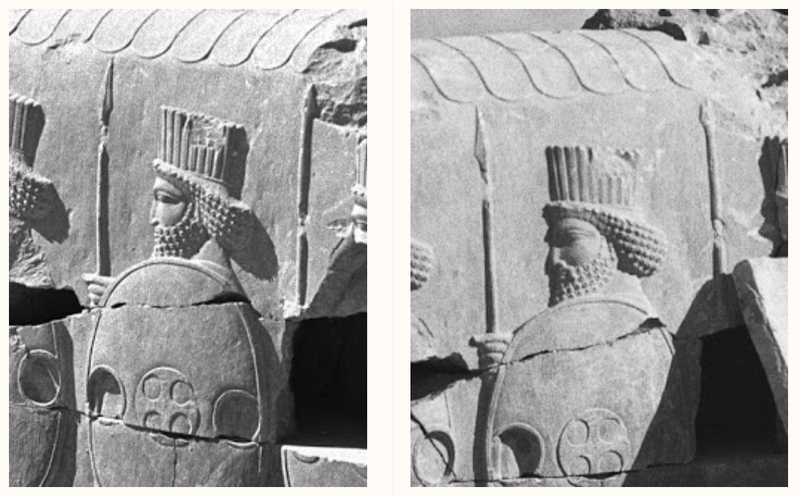 Sandstone "Head of a Guard (fragment of a low relief)" from Persepolis. 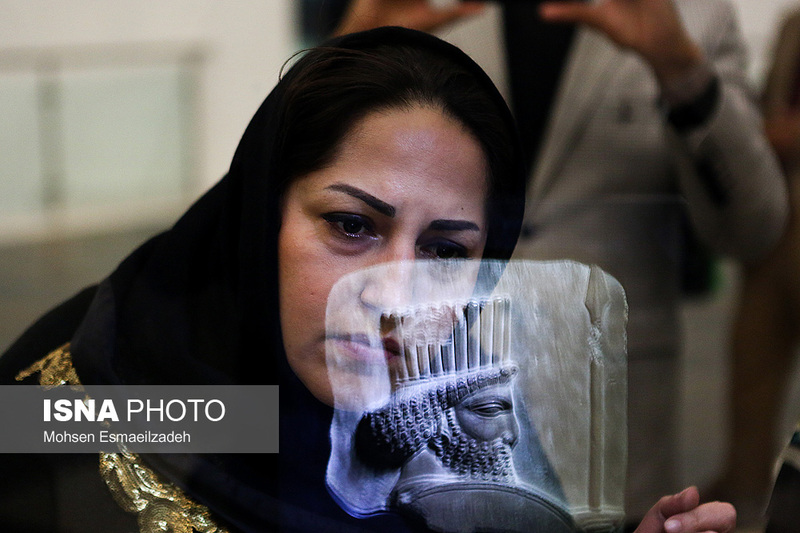 The announcement advertised a "Substantial Reward (Offered by AXA Art, subject to specific conditions) for information leading to the recovery" of the two archaeological objects. To avoid compromising the police investigation, no details of the theft aside from the video of the potential suspect, were released. 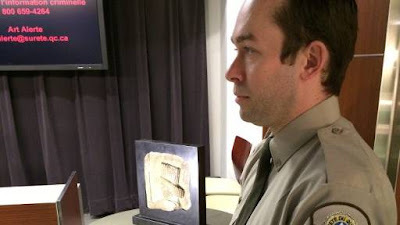 According to the press release issued for today's press conference, the $1.2 million sandstone bas-relief panel "Head of a Guard", valued at 1.2 million dollars, was recovered during a raid on an Edmonton house by an Alberta unit of the Royal Canadian Mounted Police on January 22, 2014. This action led to the arrest of a 33-year-old man who has been charged with possession of stolen goods. Surete du Quebec's spokesperson Joyce Kemp said in today's press conference said the unnamed individual arrested had purchased the object for an amount significantly inferior to its actual value. 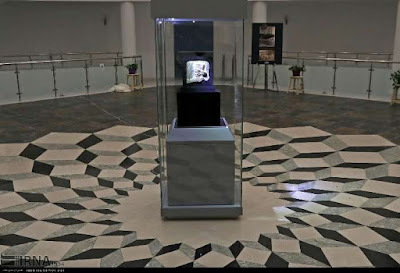 The investigation and subsequent arrest have not, as yet, led to the recovery of the second artifact, the Yellow Numidian marble "Head of a Man", valued at $40,000 and reportedly stolen on October 26, 2011 nor the thief responsible for both thefts. ARCA spoke with Mark Dalryrmple, the specialized fine art loss adjuster appointed by AXA ART assigned to this case, and asked him for his thoughts on today's recovery. His responded positively with “No comment since as may be appreciated, the matter is sub judice, but we are extremely pleased that it is been recovered safely”. 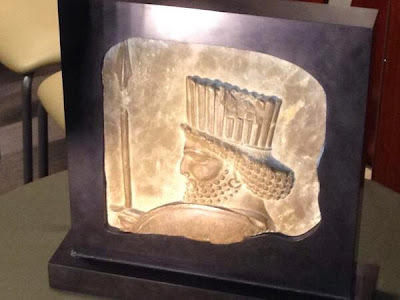 AXA ART announces the recovery of a rare and valuable Achaemenid Bas-Relief Following an intensive year long investigation between the police authorities in Montréal and Edmonton, AXA ART is pleased to announce the recovery of a rare and valuable Persian Achaemenid bas-relief panel. The panel, together with a Roman marble head, was stolen from the Montreal Museum of Fine Arts (MMFA) in 2011. The small portable panel was recovered almost 2,000 miles away in Edmonton and has now been returned to the Montréal Museum. “Given the difficulties involved in the recovery of stolen artwork we would like to acknowledge the diligence and extraordinary efforts of the Sûreté du Québec and Royal Canadian Mounted Police, in collaboration with our Loss Adjuster, in securing the return of this precious cultural property”, commented AXA ART’s Claims Manager, Clare Dewey. “The recovery should serve as encouragement for on-going investigations and as a deterrent for similar crimes. 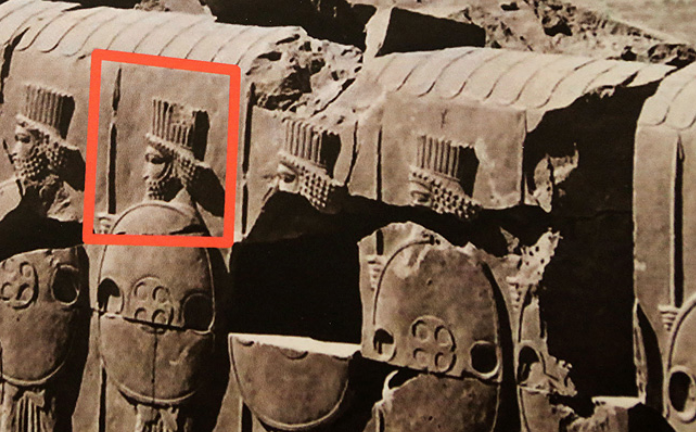 Our responsibility to our policy holders doesn’t end with a claims payment; we have a duty to work with law enforcement to recover cultural artefacts.” The Achaemenid relief dates from the 5th century BC. It is made of limestone, and worth hundreds of thousands of dollars. It has been part of the permanent collection held by the Montréal Museum for decades. AXA ART is thrilled that this object can be returned to the Montréal Museum of Fine Arts where it will continue to be enjoyed by the public for generations to come. 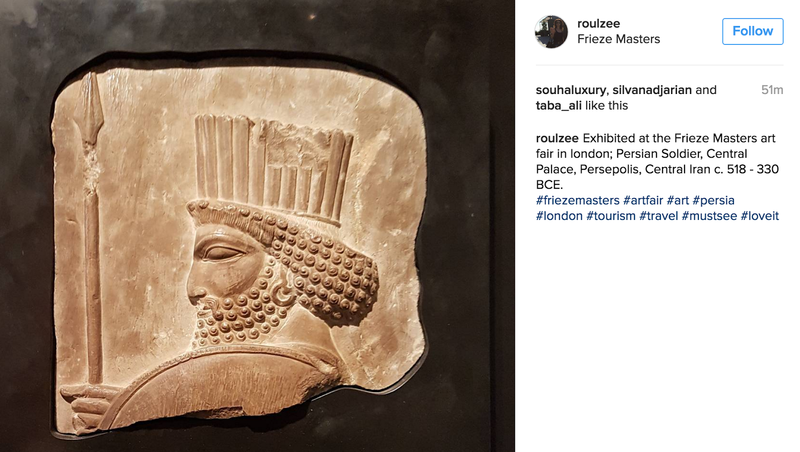 "As the Curator who was responsible for organizing the exhibition hall from which the object was stolen over two years ago, I am obviously very happy to see this beautiful work of ancient sculpture return to the museum. It was one of our only pieces representative of Persian art of the Achaemenid period (2nd half 6th century BCE to 330 BCE). 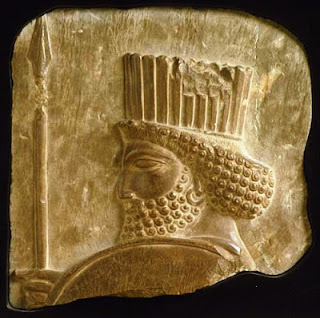 It represents in low relief the head and shoulder of an armed Persian guard and probably decorated the walls of one of the several Achaemenid palaces spread across the Persian empire. 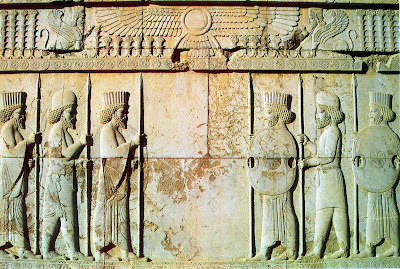 Similar pieces are found in various museums and most were looted from palace sites in the first part of the 19th century. This particular piece is very well preserved and had suffered no damage during its recent adventure. The work of the RCMP and the Sureté du Québec in recovering this artefact was remarkable and the officers in question are to be complimented for the quality of their work and its successful end. We all hope that this success will deter would-be thieves from attempting other such thefts. 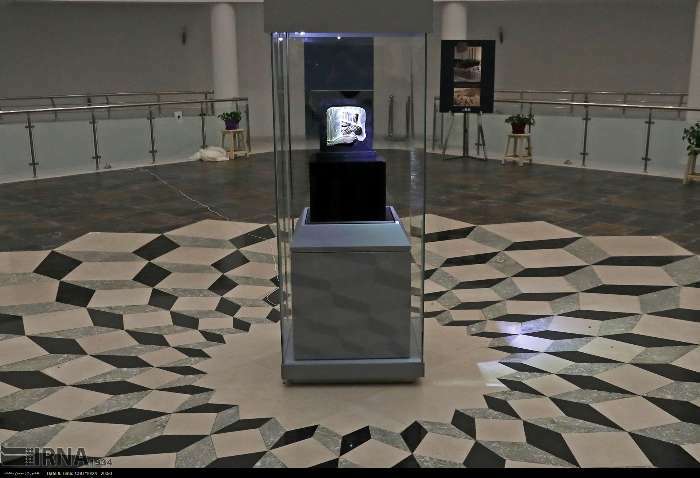 The investigation continues to try and recover the second object stolen from the museum also in the autumn of 2011." Was a reward paid? In this case no reward was given. Were the police acting on a tip? Information received from the public enabled us to advance the investigation and identify the suspect. The investigation begun by the Montreal Police (SPVM) but it was transferred to the SQ in order to make use of the expertise of the integrated artworks investigation team, which is a specialized team composed of members of the SQ and the RCMP. What charges will be filed against the suspect? The investigation shows that he did not commit the theft at the MMFA, but purchased the object knowing that it had been stolen. The arrested suspect may be charged with possession of criminally obtained property. He will appear on march 19, 2014 in the morning at the Edmonton courthouse. Montréal, le 13 février 2014 – L’Équipe intégrée des enquêtes en œuvres d’art de la Sûreté du Québec a retrouvé, le 22 janvier dernier à Edmonton, l’un des deux artefacts volés en septembre et en octobre 2011 au Musée des beaux-arts de Montréal. La pièce d’une valeur de 1,2 million $, qui a été volée le 3 septembre 2011, est un fragment de bas-relief perse datant du 5e siècle avant Jésus-Christ. Elle a été rapatriée au Québec et restituée au Musée des beaux-arts à la suite de sa découverte lors d’une perquisition dans un logement d’Edmonton en Alberta. Un homme de 33 ans d’Edmonton a été arrêté à la suite de cette perquisition réalisée avec la collaboration des policiers de la Division K (Alberta) de la Gendarmerie royale du Canada. L’enquête se poursuit pour retrouver le deuxième artefact volé, une statuette de marbre représentant la tête d’un homme de style Égypto-archaïsant datant du 1er siècle avant Jésus-Christ. Cette pièce a été volée le 26 octobre 2011. Toute information pouvant permettre de la retrouver peut être communiquée à la Centrale de l’information criminelle de la Sûreté du Québec, au 1 800 659-4264 ou à l’adresse art.alerte@surete.qc.ca. Tous les signalements seront traités de façon confidentielle. Soulignons la collaboration de la compagnie AXA Art qui a permis de faire progresser cette enquête. L’Équipe intégrée des enquêtes en œuvres d’art est formée d’enquêteurs de la Sûreté du Québec et de la Gendarmerie royale du Canada. Elle travaille en étroite collaboration avec différentes organisations qui détiennent des expertises permettant d’enquêter sur les crimes liés au marché de l’art. Pour plus d’informations sur l’Équipe d’enquête et pour s’inscrire au service gratuit de diffusion ART ALERTE, les intervenants du monde de l’art sont invités à visiter le site web de la Sûreté du Québec, au www.sq.gouv.qc.ca. Twice during fall 2011, someone walked into Montreal's Museum of Fine Arts and walked out with two ancient artifacts worth close to $1.3 million. The Sûreté du Québec, with the help of the RCMP, recently found one of the rare pieces of art in an Edmonton home and arrested a man. The other, from the first century BC, is still missing. 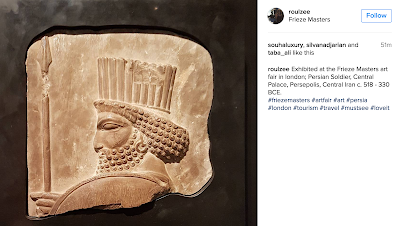 Yet the museum said its security system — cameras and agents — is fine and they have no intention of putting the treasures under protective glass. 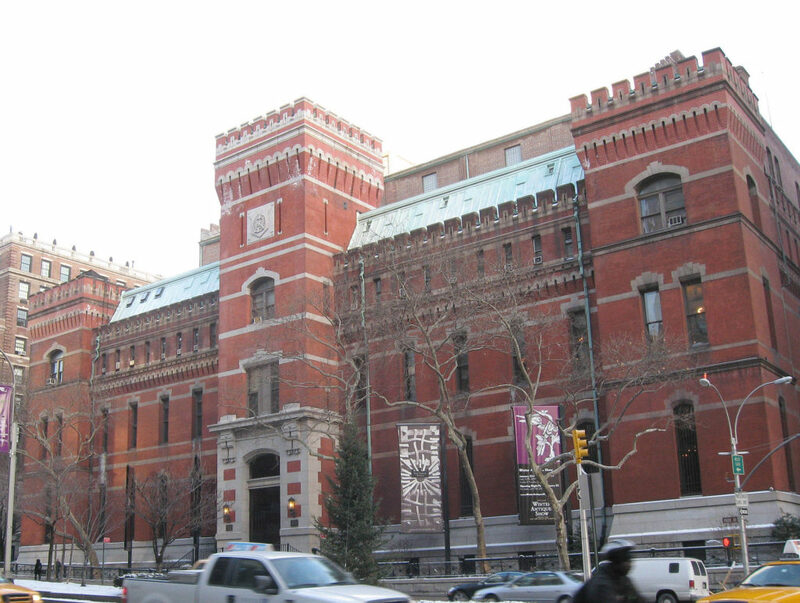 "This is very unusual," Danielle Champagne, director of the museum's foundation, said about the thefts. "Montrealers are very respectful." The last theft from the museum was in 1972, she said. A reward was offered several months after the theft. Provincial police spokeswoman Joyce Kemp said Thursday that whoever bought the artifact after it was stolen paid less than what it was actually worth. "We know that the person purchased it for a price really inferior to what is the real value of the artifact," she told reporters. Kemp would not give any details about how it was purchased. "The investigation is still ongoing (and) it might interfere with the next steps of the investigation," she said. The SQ/RCMP Integrated Art Crime Investigation Unit issued an Art Alerte for the "Recovered World of Art" (Case File: 11-098) to announce the return of sandstone Bas-Relief, noting its size (21 x 20.5 x 3 cm). Here's the link to the YouTube channel for the Sûreté du Québec if they publish a video of the conference. This article examines the Canadian print media’s construction of art fraud from January 1978 until December 2012. Our content analysis of N=386 articles reveals that art fraud was portrayed as a low-risk crime that pays and as a “victimless” crime. In contrast to conventional crime news, which is situated in the front portions of newspapers, articles on art fraud were most often positioned in sections devoted to “entertainment.” The media’s portrayal of art fraud as a phenomenon that was more entertaining than vexatious resonated in its portrayal of offenders as charming rogues and artful dodgers, with the most notorious of offenders depicted as heroes, and in its casting of victims as fools or “legitimate” victims. This peculiar construction would seem to offer considerable inducements for schadenfreude, a revelling in the misfortunes of others. Adie Nelson received her PhD at the London School of Economics and is an Associate Professor in the Department of Sociology & Legal Studies at the University of Waterloo. She is the author/co-author/editor/co-editor of approximately two dozen books and her writings have appeared in journals such as the British Journal of Sociology, Psychology of Women Quarterly, the Journal of Contemporary Ethnography, Qualitative Sociology and the International Review of Victimology. Design for this issue and all issues of The Journal of Art Crime is the work of Urška Charney. 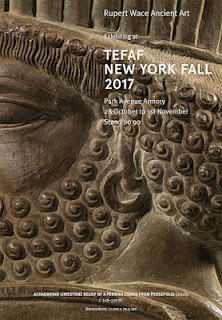 Here's a link to ARCA's website on The Journal of Art Crime (includes Table of Contents for previous issues). The Story of Stolen Fine Art really starts with Reet Herder. Reet was the first to let us know there was an issue. Reet wrote that she and others had suffered such a devastating loss. I shocked to hear just how bad it was. We always like to respond to artist request for features, or listen to their business issues, and look for ways we can assist. This practice has been wonderful for both the artists and for our development as a service. Peter Newell and I put our heads together and figured we could host the images of stolen art as a collection. The MyArtClub site was already set up to host artist groups, so we simply leveraged that as a way to focus on this awful issue. What we did ask artists for was a police reference number of some kind and police and artist contact information. We have a form for artists to fill out (available on our website). Over the years Reet has been really a founding member of our website and involved in creating the form. Karma has a way doesn’t it? She helped build a service that we host and hope it is of some use to artists, and voila – her art is the one found through the Internet! I telephoned Reet to congratulate her on the recovery. Reet is amazed at not only the painting’s recovery but the media attention! “All I did was paint it” she says. This was one of her earlier works, but she was happy with how it had turned out. It was based on a visit to Schooner Cove. 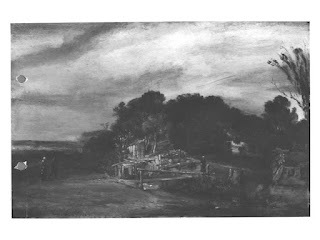 The story continues: as might be expected the painting itself was not in the best of conditions. However with luck Reet had prepared to create giclees from this art, and so offered this kind family a giclee in return which they accepted. Reet says “ the giclee’s colours look better”. She presents it tomorrow to the father at his work. About us: My wife Heather Anderson and a neighbour Terry Newell, both artists, thought their husbands should get together and do websites for artists. I was studying Internet Marketing and had many years in Sales and Marketing, and Peter Newell had many years in computer software and project management. We created the site to be a fair deal. We believe artists deserve assistance with business issues, and we wanted on our part to give back to our community using our skills. Also we found and still do find so many who offer help to artists seem to be out to gouge them. Maybe that is reality – you have to charge high prices to survive, but as we have jobs, we don’t. But look at this example: in the year 2000 a company offered my wife an artist website with 10 images for $1,000. At the time too, most artist websites were static, artists had to repay the site creators to change an artwork. We wanted to fix that. So we kicked off MyArtClub.Com in year 2000 ( such an early time! Artists then had no digital cameras, and used scanners to create images for their sites). We set out to launch a service for what is now $45 per year that gives amazing value for an artist website. We had to follow our artist’s wives directive – they should be able to change anything they wished, anytime, instantly. In other words, be in total control. However, just having a website is not the answer. You need traffic. We advise artists what they can do to build traffic, and have through newsletters and our blog tried to keep them informed about ideas and opportunities. We felt a “portal” into the art world would help visitors see more art, and drive traffic to artists’ sites. And yet we provide each artist a standalone website. We thought the name MyArtClub fit as we are here to help both artist and art patrons connect. We also know that many artist belong to collectives, sometimes called clubs although many feel that is a little beneath the professional artist. We decided MyArtClub even if controversial had the right motivations, and buyers liked the name, so we launched it. While we appear to be local to BC, in fact we have artists who have posted art from all over the world. Some load a free 3 images, so they can link from our portal back to their website. It is our form of links. Others sign up for an artist website, we have many across Canada and some in UK, Australia, Europe even Asia. Sadly we have had very little take up in the USA. We have really not tried hard, but I think the out of country aspect maybe an issue. Anyway, big opportunity when retired! We are here to help artists with their Internet marketing. We give free presentations on what artists need to know. We host a large database which we advertise to increase artists chances of being found online. We have researched the customer base to help our artists understand the who, what, where, when and why of art buyers, and we give this report free to all who ask. All this and so far we have not taken a single dollar of commissions. Either we are crazy, or we really do just want to help artists progress with their business. Newly released RCMP and university campus security records obtained by Postmedia News through federal and provincial access-to-information laws, plus court documents, offer a fuller picture of the mysterious theft and its bizarre fallout. 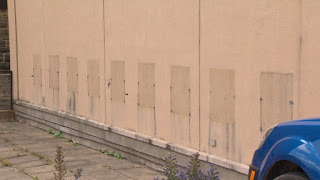 At about 4:40 a.m. on May 24, 2008, thieves removed "a glass panel" from the back of the museum, "unleashed a cloud of bear spray, presumably to repel any guards who might try to intervene" and smashed a glass showcase to steal $2 million of jewelry designed by Haida artist Bill Reid (Quan, quoting campus security report). The heist was estimated to have taken less than 3 minutes (compared to the more than 2-minute Kunsthal Rotterdam heist on October 16). According to Quan's review of the report, "security cameras stopped recording before the break-in". UBC's Museum of Anthropology has since been renovated and expanded. Contrary to media reports that suggested he had been on a smoke break and apparently oblivious to trouble, the guard alerted dispatch when the alarms started wailing, the former security officer said. Protocol at the time dictated that the guard stay put and that dispatch send another officer to walk through the museum. But the walk-through never happened, the former security officer said. An alarm falsely attributed to "invalid"and a "false sense of security" (Quan) were problematic. According to Quan, the investigation, led by the RCMP major crimes section, involved an anonymous tip within days of the theft; police surveillance of the suspect; background checks on construction workers involved in the renovation of the museum, a fired security guard, and "disgruntled" artists who had worked with Reid. A search of a home connected to a man with "at least 11 convictions for property crimes" led to the recovery of "all but two of the stolen items" on June 8 (just a little more than two weeks after the theft). By August the other items were recovered: "The last piece, the argillite pipe, was dropped off anonymously. (Quan)"
Then in January 2009, CBC reported the RCMP had paid $20,000 to a criminal informant for "help with the investigation." According to Quan, the RCMP "would not say this week who received the money or how much was paid" and the case is "unresolved" and that "two years after charges were recommended in the museum heist, Crown counsel notified RCMP there wasn't enough evidence to lay charges." 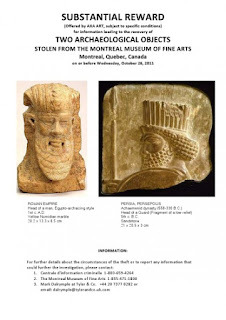 Last year on October 26, someone stole two ancient sculptures from the Montreal Museum of Fine Arts. Three months later, the Montreal Gazette and AXA Art, the insurance company which insured the pieces, released a video on YouTube from the surveillance camera inside the museum showing a suspect wanted for questioning in the investigation. AXA Art Insurance issued a press release dated February 13, 2012: "AXA Art Offering Substantial Reward for Safe Recovery of Rare Artifacts". The Montreal Museum of Fine Arts issued no press release in 2011 or 2012 regarding the theft, a reward, or an ongoing investigation -- at least it's not listed on the museum's website. The Sûreté du Québec's Art Alerte publicized the stolen works and the poster in English and French offering the "Substantial Reward" also on February 14 (Alain Dumouchel responded in an email at that time that the Montreal police were in charge of the investigation). The Art Alerte for Case File: 11-98 also included a picture of the suspect captured by the museum's surveillance cameras. 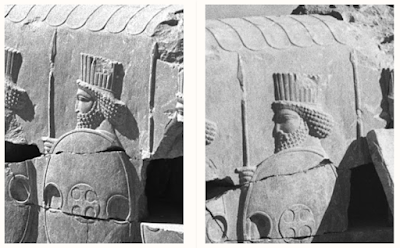 The "Head of a guard" (fragment of a low relief) is estimated to as old as 5th century BCE from Persepolis (Persia), the capital of the Achaemenid dynasty (558-330 BC). 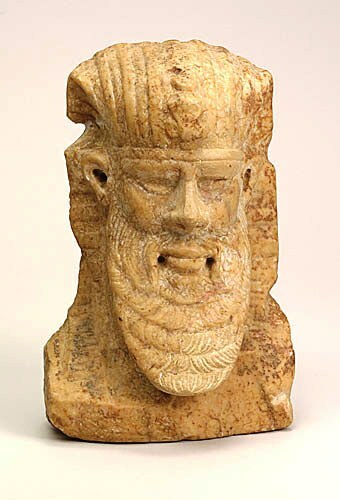 The second object, Head of a Man (Egypto-archaizing style) of yellow Numidian marble, is dated from the Roman Empire around 1st century A.D. Neither of these objects was highlighted in the MMFA's museum guide. 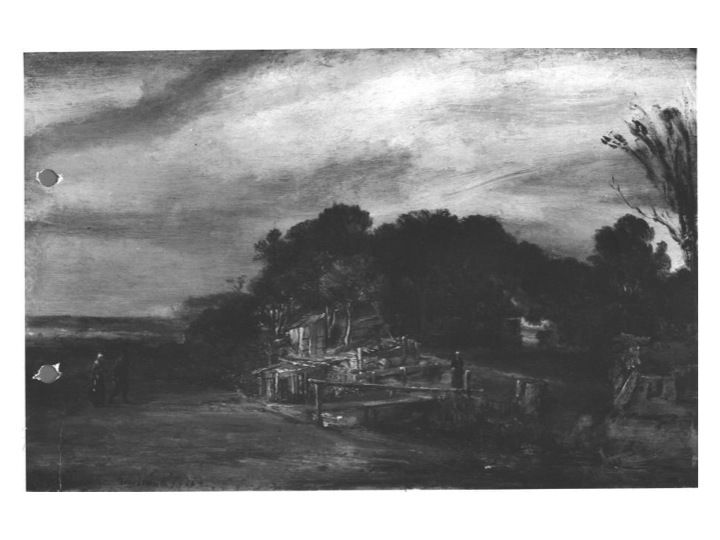 In 1972, the Montreal Museum of Fine Arts was the site of Canada's largest art theft when three thieves stole 18 paintings, including a painting attributed to Rembrandt. The theft remains unsolved after an aborted ransom attempt and 17 of the paintings are still missing.